Account of a Doubler of Electricity. This letter from Abraham Bennet to the Royal Society appears in Philosophical Transactions V77 (1787) pages 288-296. A Table and a Diary are included. XXVII. An Account of a Doubler of Electricity, or a Machine by which the least conceivable Quantity of positive or negative Electricity may be continually doubled, till it becomes perceptible by common Electrometers, or visible in Sparks. By the Rev. Abraham Bennet, MA; communicated by the Rev. Richard Kaye, LLD, FRS. The great importance of a machine for the purpose of detecting very minute quantities of electricity has occurred to many of the cultivators of this science; as by such an assistant not only many chemical combinations or solutions, but also many yet unexplained atmospherical phaenomena, may become intelligible. The labours of M. VOLTA have been very successful on this subject by the application of his condenser (as he terms it), which, by means of a thin coated electric, is capable of receiving a greater quantity of electrical fluid than a common insulated conductor, and rendering it perceptible by separating the positive and negative sides of the charged plate. On this ingenious contrivance Mr CAVALLO made a very considerable improvement by transferring the received quantity of electricity from a larger to a smaller condenser, as explained in the Phil. Trans. Vol. LXXII. of it in a thunder-storm. I therefore contrived the following doubler for the purpose of more easily making an electrico-meteological diary, which I undertook at the request of my friend Dr DARWIN, who hoped, that from thence some lights may be thrown on the causes of the sudden changes of aerial currents, a circumstance of so much importance to the early growth and maturity of vegetation. I place upon my electrometer, described in a former Part of the Philosophical Transactions, a circular brass plate, three or four inches in diameter, polished and thinly varnished on the upper surface. On this I place another brass plate, of equal diameter, polished and varnished on both sides, with an insulating handle attached to one edge of it. A third plate is also provided, of equal diameter, polished and varnished on the under side, and with a perpendicular insulating handle from the center of the upper side, similar to those mentioned in the Appendix to my last Paper. 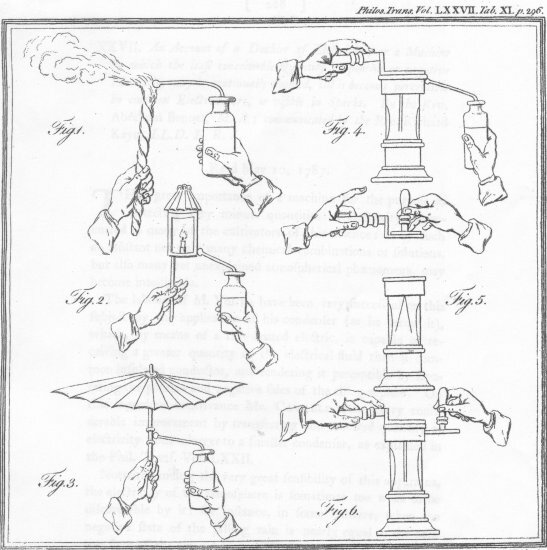 the second plate by its insulating handle, and if the electricity be not now sensible to the electrometer, I place the third plate, by means of its insulating handle, upon the second plate, thus elevated: then touching the third plate, by stretching a finger over the juncture of its insulating handle, and again withdrawing the finger. I then again separate the third plate from the second. In this situation it will be apparent to electricians that two of the plates are of one kind of electricity, and nearly of equal quantity, and one only of the other. I then apply the third plate to touch the under surface of the first plate which remains on the electrometer, and at the same time covering the first plate with the second, I then touch the second plate by stretching a finger over the juncture of its insulating handle: and first taking away the third plate, and then withdrawing my finger from the second, and lifting it up from the first plate, the electricity becomes doubled. If by this first operation the quantity of electricity does not become sensible by the electrometer, I repeat the process to ten or twenty times, which, by doubling it every time, makes visible the smallest conceivable quantity of electricity, since, at the twentieth operation, it is augmented to above 500,000 times. And though in description the above process of doubling to twenty times may appear tedious, yet when the operator can perform it with sufficient readiness (which is soon acquired) it takes less time than 40 seconds. The collection of electricity from the air, and the touching and position of the plates, are represented in Tab.XI figures 1.2.3.4.5. and 6. If it be required to produce sparks, the plates are to be placed upon an insulating stand, without an electrometer, and the process repeated as above till the sparks appear. gold of the electrometer be made to diverge to a certain distance by the above process, that distance will be nearly doubled by repeating the operation. Another proof of this duplicate accumulation is, that, when the third plate is applied to the first, the divergency of the leaf gold is apparently undiminished, though in this situation their electricity is diffused over double the quantity of surface. That flame will collect electricity better than points was mentioned in my former Paper, and is very evident if two phials of equal capacity are exposed to the air, the one furnished with a sharp point, and the other having its knob applied to an insulated flame, and their electricity afterwards examined by the doubler. If the weather be rainy, an insulated umbrella may be carried in one hand, and the knob of the phial applied to the upper and insulated part of the handle; and if it rains so slowly as not sufficiently to communicate electricity to the umbrella, a torch is carried under the umbrella, and used as described above. It is obvious that some caution is necessary in managing experiments of so much nicety, since, by the least friction of the hand on the varnished sides of the plates or insulating handles, or if the metallic side of one plate be accidentally rubbed against the varnished side of the other, some degree of electricity is produced, which, becoming sensible by the operation of doubling, may render the experiments equivocal. wax of the insulating nut, but occasionally to stretch a finger over it to touch the plate, whilst the mahogany handle is held in the same hand. Having found, by repeated experiments, that two clean metallic plates, or two equally varnished plates, rubbed together, produced no electricity, I varnished the second plate on both sides, but more thinly than when one side only was varnished, and in some experiments used thimbles on the ends of the touching fingers. In this way the inconveniences of accidental friction were in some measure obviated, but much less than I first expected; for, notwithstanding the utmost care, electricity is produced without previous comunication: therefore, in experiments requiring the electricity to be often doubled, its communication may yet be ascertained by applying it to the first and second plates alternately; so that positive electricity communicated to the first plate appears positive by the electrometer; but the same electricity, applied to the second plate whilst the first is touched, produces negative in the electrometer. I beg leave to add, that this method of doubling either positive or negative electricity, as well as M. VOLTA's condenser, with Mr. CAVALLO's improvement on it, as also the ingenious experiments of Father BECCARIA with double plates of glass, which he separated after charging, are all of them to be explained from the same principles with the Leyden bottle, of which they may be all said to be only different applications. I shall not therefore trouble the Society with any further theory on this subject, but proceed to lay before them the diary which I have hitherto kept, and during which time I have found no difficulty in collecting electricity from the atmosphere positive or negative, so as to become sufficiently sensible by the above described apparatus, though the hygrometer has sometimes shewn the greatest degree of moisture. The atmospherical electricity was sometimes so strong as to need no doubling, and mostly required only one application of the second plate, yet I frequently found it neccesary to repeat the process from two or three to twenty times. Perhaps the exact comparative quantity of electricity residing in the atmosphere might be measured by the number of operations required to render it perceptible by the electrometer, all other circumstances being cautiuosly attended to. If the electricity of the atmosphere should happen to be much weaker than I have yet found, there remains not only the resource of doubling oftener, but the capacity of the instruments may be much increased; as, first, by using a larger flame; secondly, by elevating it higher; thirdly, by collecting the electricity with a very thin glass ball, silvered within, and coated on the outside in the common way, or gilt; fourthly, by grinding and polishing the plates of the doubler very exactly; fifthly, by making the experiments in an advantageous situation. In all these particulars my apparatus was defective, yet amply sufficient for the discovery of the atmospherical electricity. After considering the successful effect of flame, in collecting atmospherical electricity, I placed an insulated lantern upon a pole about fifteen feet high, and suspending a gold thread from the lantern connected it with the electrometer, and was agreeably amused with feeling the pendulous gold leaf open and shut with every passing cloud. about an hour, some drops of rain beginning to fall, the appearance of electricity with this apparatus entirely ceased, though I elevated the lantern several times in the course of the day.